Cufflinks.com has a web store with exclusive Star Wars apparel, and the merchandise does not disappoint. They offer beautiful ties, socks, pins, tie bars, money clips, and much more. The quality is of a very high standard as well. Consumers can find items for the well-dressed Star Wars fan, as well as for collectors who want to display their pieces. We both received a sample from the collection, and were pleased with the results. 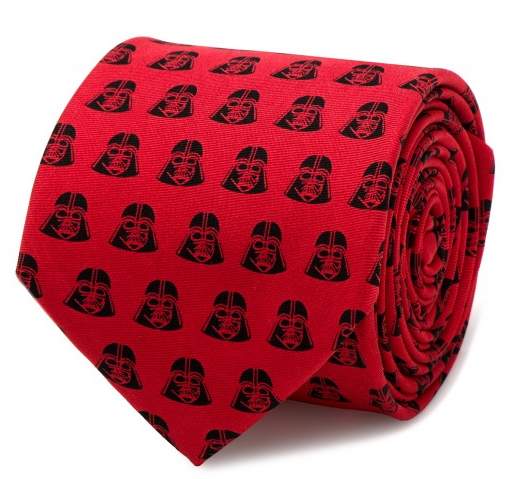 The Darth Vader tie is 100% silk, and is of a very high quality. It measures 59″ x 3″ and is officially licensed by Lucasfilm. The Vader design is noticeable, but subtle and classy, and makes for a professional appearance at the office, out to dinner, or wherever you would prefer to dress up. I liked it so well that I wore it on Christmas Eve, and received a lot of compliments. It is a great looking, well-constructed tie; in essence, you can get away with wearing Star Wars merchandise in the professional world, and compliment multiple aspects of your individual style. My wife even liked it; nothing wrong with that! As winter is now in full swing for the bulk of the US, I find myself having a hard time trying to stay trendy with outfits and stay conformable. It actually came down to one special day in December for me as a certain debut of a film series was being eagerly awaited. Lots of sites offer wonderful interpretations for Star Wars apparel, but as wanting to celebrate fandom my own way, I found that the designs on Cufflinks.com had a great offering of socks for the dress down type of fan that I am. I happily wore these warm socks to my local premiere and they were fun to show off to others, most remarking that they wish they had a pair of Star Wars socks. Not only can I wear them to my favorite geeky events, but they are comfortable for business attire as well, and if the stars align, I hope to wear them during my first Disney Run Star Wars 5K next year! So, if you’re looking to upgrade your outfit for a more casual expression, I recommend these rock’n socks from Cufflinks.com! Note: Special thanks to Cufflinks.com for providing the tie and socks to review. In the interest of full transparency, Cufflinks.com is an affiliate of ours; we make no secret of that. However, as discerning collectors, we appreciate high quality, and feature items that we have in our homes. The above reviews were in no way influenced by any affiliate agreement. Next article Star Wars: The Ultimate Vinyl Collection -- Now Available! Previous article The Caffeinated Collector: Episode 24 - They Made Another One? Great review of every-day items to wear, Dan and Cory! I know your reviews are unbiased, and with so much SW merchandise hitting the stores and shelves over the course of the past few months (and moving forward, I hope! 🙂 ), it’s great to hear comments like these.